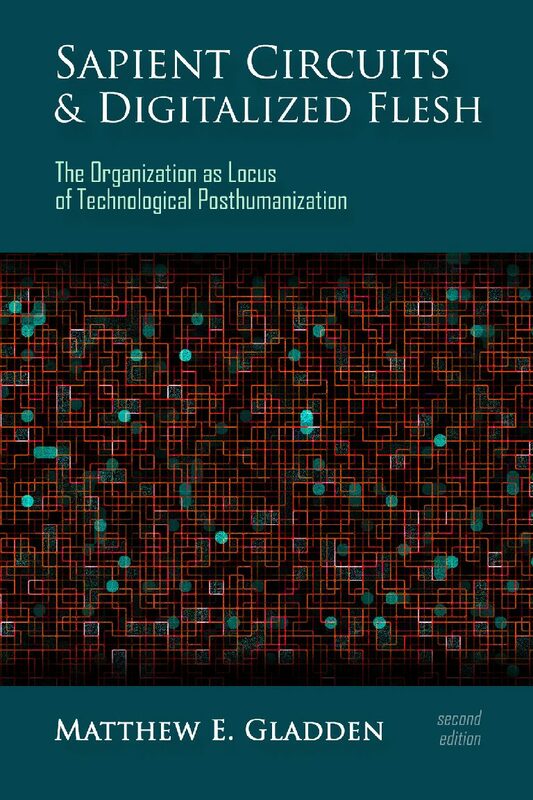 Home Posts tagged "human-robot interaction"
ABSTRACT: Increasingly, organizations are becoming “technologically posthumanized” through the integration of social robots, AI, virtual reality, and ubiquitous computing into the workplace. Here a phenomenological approach is used to anticipate architectural transformations of the workplace resulting from posthumanization’s challenge to traditional anthropocentric paradigms of the workplace as a space that exists at “human” scale, possesses a trifold boundary, and serves as a spatiotemporal filter. ABSTRACT: The human beings who manage global virtual teams regularly face challenges caused by factors such as the lack of a shared language and culture among team members and coordination delay resulting from spatial and temporal divisions between members of the team. As part of the ongoing advances in artificial agent (AA) technology, artificial agents have been developed whose purpose is to assist the human managers of virtual teams. 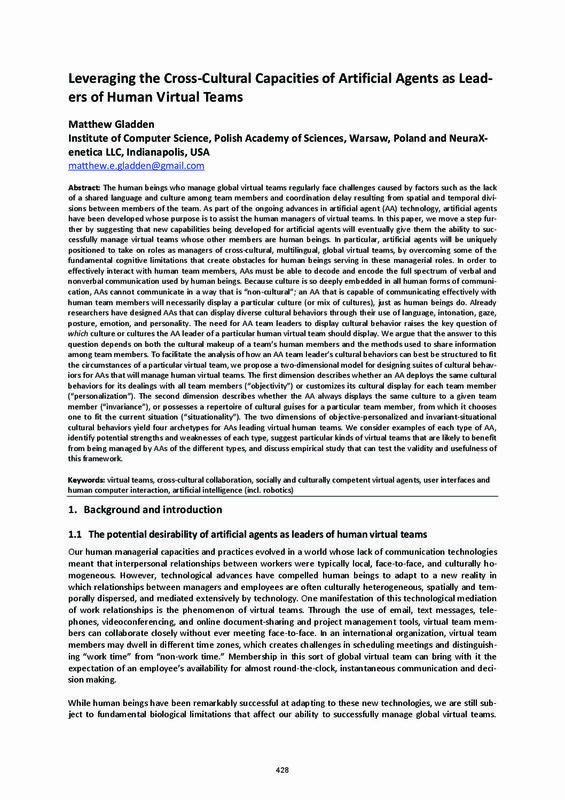 In this paper, we move a step further by suggesting that new capabilities being developed for artificial agents will eventually give them the ability to successfully manage virtual teams whose other members are human beings. 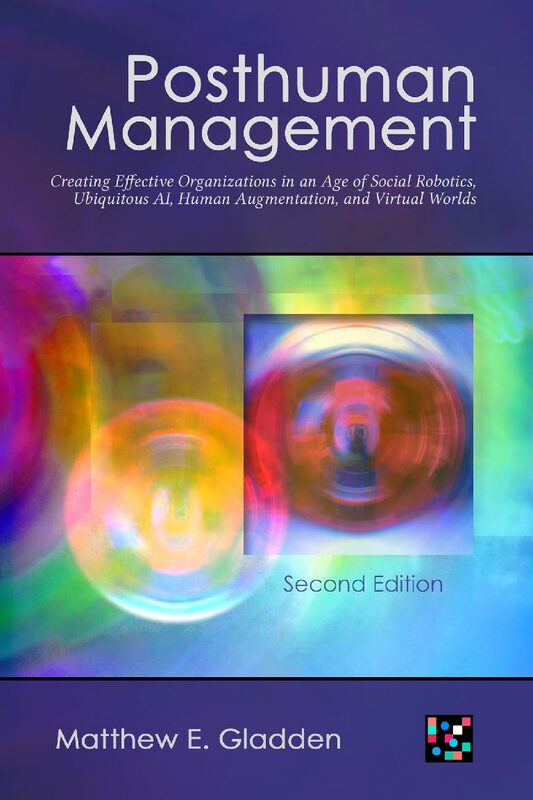 In particular, artificial agents will be uniquely positioned to take on roles as managers of cross-cultural, multilingual, global virtual teams, by overcoming some of the fundamental cognitive limitations that create obstacles for human beings serving in these managerial roles. In order to effectively interact with human team members, AAs must be able to decode and encode the full spectrum of verbal and nonverbal communication used by human beings. Because culture is so deeply embedded in all human forms of communication, AAs cannot communicate in a way that is “non-cultural”; an AA that is capable of communicating effectively with human team members will necessarily display a particular culture (or mix of cultures), just as human beings do. Already researchers have designed AAs that can display diverse cultural behaviors through their use of language, intonation, gaze, posture, emotion, and personality. The need for AA team leaders to display cultural behavior raises the key question of which culture or cultures the AA leader of a particular human virtual team should display. We argue that the answer to this question depends on both the cultural makeup of a team’s human members and the methods used to share information among team members. To facilitate the analysis of how an AA team leader’s cultural behaviors can best be structured to fit the circumstances of a particular virtual team, we propose a two-dimensional model for designing suites of cultural behaviors for AAs that will manage human virtual teams. The first dimension describes whether an AA deploys the same cultural behaviors for its dealings with all team members (“objectivity”) or customizes its cultural display for each team member (“ personalization”). The second dimension describes whether the AA always displays the same culture to a given team member (“invariance”), or possesses a repertoire of cultural guises for a particular team member, from which it chooses one to fit the current situation (“situationality”). The two dimensions of objective-personalized and invariant-situational cultural behaviors yield four archetypes for AAs leading virtual human teams. 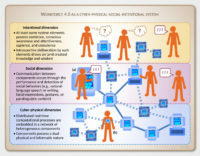 We consider examples of each type of AA, identify potential strengths and weaknesses of each type, suggest particular kinds of virtual teams that are likely to benefit from being managed by AAs of the different types, and discuss empirical study that can test the validity and usefulness of this framework. 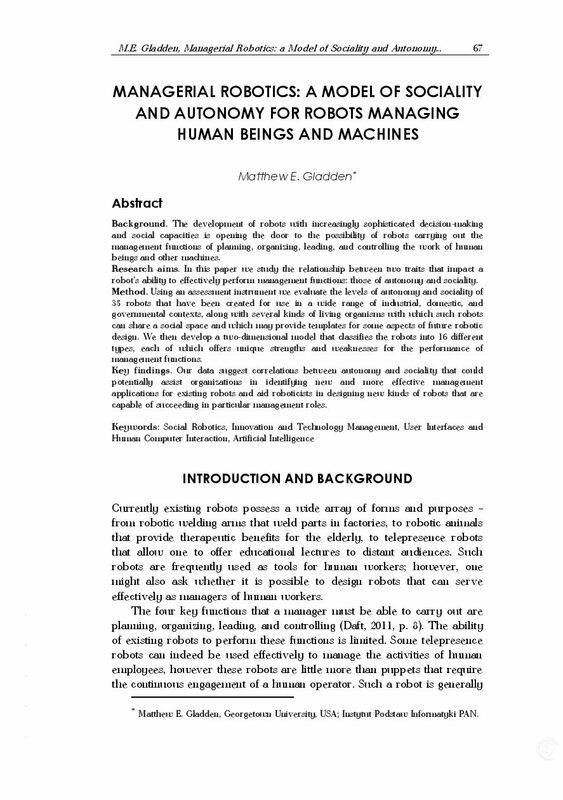 ABSTRACT: The development of robots with increasingly sophisticated decision-making and social capacities is opening the door to the possibility of robots carrying out the management functions of planning, organizing, leading, and controlling the work of human beings and other machines. 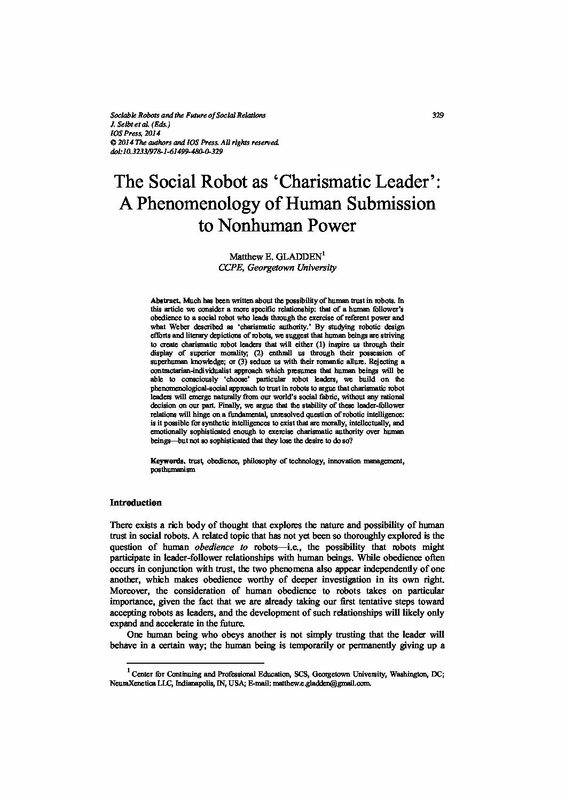 In this paper we study the relationship between two traits that impact a robot’s ability to effectively perform management functions: those of autonomy and sociality. Using an assessment instrument we evaluate the levels of autonomy and sociality of 35 robots that have been created for use in a wide range of industrial, domestic, and governmental contexts, along with several kinds of living organisms with which such robots can share a social space and which may provide templates for some aspects of future robotic design. We then develop a two-dimensional model that classifies the robots into 16 different types, each of which offers unique strengths and weaknesses for the performance of management functions. Our data suggest correlations between autonomy and sociality that could potentially assist organizations in identifying new and more effective management applications for existing robots and aid roboticists in designing new kinds of robots that are capable of succeeding in particular management roles. ABSTRACT: The measure of availability is frequently used to compare the dependability of computer-based systems. However, it is an imperfect measure insofar as two systems with the same availability can display radically different performance characteristics. Here we develop a new fractal temporal measure for work effort which – used alongside availability – offers richer insight into the performance of computer-based systems. We establish that this fractal measure can be applied to the temporal work patterns of both human and artificial agents, allowing direct comparisons between them. 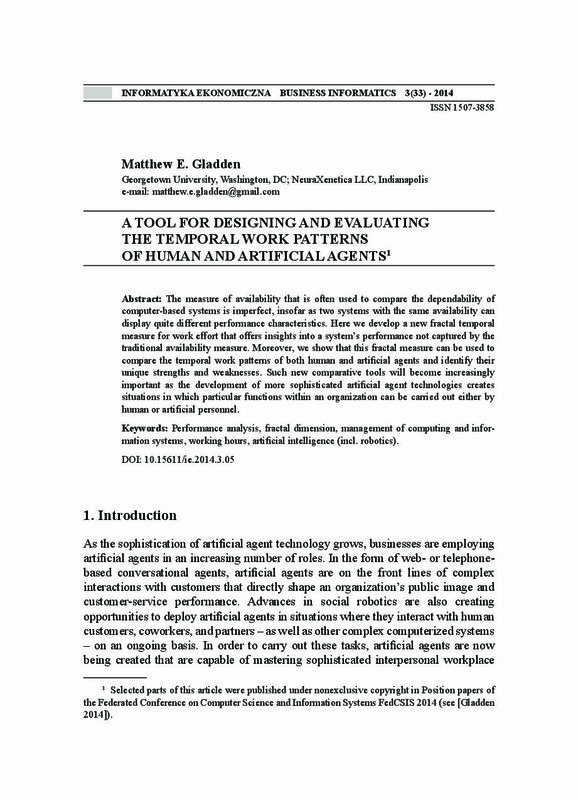 By analyzing six hypothetical cases, we demonstrate that this new measure reveals unique strengths and weaknesses in human and artificial agents’ work patterns that are not captured by the traditional availability measure. We also identify circumstances in which such new comparative assessment tools will become increasingly important for organizational designers and solution architects, as the development of more sophisticated artificial agents creates situations in which particular functions within an organization can be carried out either by human personnel or artificial agents.